Please Note: Only 1 Berkshire Menus Gift Certificate Can Be Redeemed Per Visit. 2 Meatballs, 2 Sausage, 4 Pieces of Garlic Bread and 2 Mozzarella Sticks. Takes you back to the carnival days, old fashion fried dough, in nugget style. Dozen per order. Your choice of Cinnamon Sugar or Confectionary Sugar. Crisp tossed Greens, Ham, Turkey, Sliced Egg, Sharp & Mozzarella Cheeses and Tomatoes. Papa Joes version of a Classic Salad. Our Crispy or Grilled Chicken Tenders over Crisp Greens, Tomato, Olives, Peppers & Cheese. Mixed Greens with Sweet Tomatoes, Fresh Mozzarella and Homemade Balsamic Served On The Side, Sprinkled with Basil. Pepperoni, Mozzarella, Mixed Greens, Tomatoes, Olives, Marinated Mushrooms and Artichoke Hearts. A Great Greek Salad Famous for it's Delicious Greens, Feta Cheese and Special Peppers. Rotisserie Chicken, Crisp Tossed Greens, Tomato, Olives and Peppers. All Kids Meals Include Juice Pouch and Treat. Pick up to 3 toppings. Cheese Ravioli served with Papa's Tomato Sauce. the Dough before they are formed. 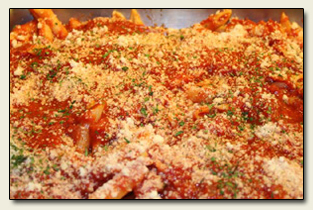 One of our Family's Favorite Pastas. Ziti with Ricotta Topped with Sauce and Melted Mozzarella Cheese. Pasta and Cheese Lovers Delight. A Variety of Special Chesses Blended in Cream, Butter and Parmesan Cheese. Battered Dip Eggplant set the Right Beginning to an All Time Winner. Fresh Tomatoes, Spinach, Basil Sautéed in Oil & Fresh Garlic Seasoned with Parmesan. Add Chicken Breast with Melted Provolone Cheese...$17.99. A Generous 12 oz. Cut of our Slow Roasted Black Angus Prime Rib, Seasoned Just Right then Grilled to Perfection, served in its natural juices. You can't go home without trying a piece, it will bring you back again and again. Homemade Tomato Sauce and Melted Mozzarella. Breaded Veal Topped with Cheese & Tomato Sauce. Served with a Side Pasta. Chunks of Tender Chicken with Peppers, Onions and Mushrooms served over Linguini. Tender Breast of Chicken and Vegetables sautéed in Butter, Wine and Creamy Alfredo Sauce. Served with Fettuccini Noodles. Whole Shell Clams Sautéed in Garlic Butter & Wine and lightly seasoned. Clams, Shrimp in a Garlic Butter and Wine Sauce with our Creamy Alfredo Sauce. All Dinners above Served with Fresh Garden Salad and Papa's Own Homemade Italian Bread. Made with our Famous Homemade Pizza Dough and a Blend of 3 Cheeses. A Meal in itself. Served with Papa's Homemade Sauce on the side. With Sausage, Mushrooms, Peppers & Onions and Pepperoni. Or we will customize your Calzone for you, with your own toppings. Every Sunday 4PM to 8PM. Kid's 10 & under $3.99, Kid's 3 and under Eat Free. Just Like Sunday Dinner At Mama's House, A Table Full OF Food. Our Table Has Over 25 Items, Homemade Pizza, Pasta, Homemade Meatballs, Salad and Much More! Every Wednesday through Friday 11AM to 2PM. 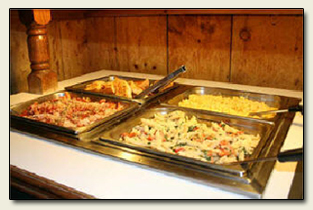 Homemade Pizza, Pasta, Chicken, Veggies, Potato Salad Bar and More! Kid's 10 & under $3.99, Kid's 3 and under Eat Free. All Served on Papa Joe's Very Own Homemade Italian Bread or Wrap. Peppers & Onions Topped With Mozzarella Cheese. Broiled Tender 100% Real Chicken Breast, Ham and Cheese. Hot Sauce, Blue Cheese Dressing, Lettuce, Onion & Cheese. Papa Joe's pizza is made from an old family recipe. We start with Papa's Homemade Pizza Dough, we add our own pizza sauce made just like Mama did from the finest whole plumb tomatoes. We only use 100% mozzarella cheese & only the finest toppings. Made to represent the colors of the Italian flag, chunky tomato sauce, fresh mozzarella & basil. A pizza fit for a king or queen. Chunky tomato sauce, fresh mozzarella, basil with a blend of cheeses. Pepperoni, Italian Sausage, Hamburg, Mushroom, Onion and Green Peppers. Pepperoni, Italian Sausage, Sweet Sausage, Hamburg, Mushroom, Onion, Green Peppers, Ham & Anchovies. Hot and Spicy, Hot as a Volcano. Pepperoni, Hot Sausage, Ham, Onions, Garlic, 2 kinds of Hot Peppers and a Special Hot Sauce. Pizza made with Barbeque Sauce, Onions and your Choice of One Topping: Beef, Pork or Chicken. Barbeque Combo Priced Accordingly. Pineapple, Ham and Green Peppers. A Cheese & Tomato Lover's Delight. 5 kinds of Cheese Topped with Fresh Tomato. Pepperoni, Ham, Meatball, Italian Sausage and Chicken. Spinach, Tomato, Bacon and Onion. Chicken, Peppers and Onions with Hot Buffalo Wing Sauce. Hamburg, Refried Beans & Cheese Topped with Tomatoes, Lettuce, Onion and More Cheese. Taco Sauce on the side. Invented in Chicago in 1943, this pizza has become world famous. Now Papa Joe's adds this pizza to it's family. Made to order in a deep pan, lined with our homemade dough. Loaded with mozzarella and a variety of other cheeses, plus the best ingredients we can find. Serves 3-4. Wise guys start here work your way up adding your own toppings for a delicious pizza. Start with Papa's homemade crust, lots of cheese and chunky tomato sauce. The pizza you can't refuse. Lots of cheese, pepperoni, Italian sausage, sweet sausage, mushrooms, hamburg, sautéed peppers and onions with chunky tomato sauce. The head of the family, respectively delicious. Our famous crust full of cheese, pepperoni, Genoa salami, ham topped with chunky tomato sauce & parmesan cheese. You will make a good connection with this one. Shaved sirloin steak, sautéed peppers & onions, chunky tomato sauce and again lots of cheese. The traitor of this family style pizza. Fajita chicken, blend of cheeses, sautéed peppers & onions and salsa sauce served with sour cream. This one is sure to be a big hit. Roasted red peppers, garlic, onions, chunky tomato sauce, lots of marinated mushrooms and loaded with cheese. You will pledge your respect to this one because it's so good. Ricotta cheese, lots of mozzarella, spinach, broccoli and fresh tomato topped with parmesan cheese. The one whose destiny is to establish itself as one you will never forget. Our homemade crust filled with eggplant, sautéed peppers and onions, ham and chunky tomato sauce. Grandma's very own recipe of 100% pure olive oil, fresh garlic, parsley and secret spices. This makes the tastiest homemade pizza. White Pizza, Pure Olive Oil, Garlic, Parsley, Secret Spices & Extra Cheese. Blanca Pizza with Fresh Tomato, Broccoli, Onions, Ricotta and Mozzarella Cheese. Vinegar served on the side to add that tantalizing taste you never had before on a pizza. Something new, something different, something great. Try One. Grilled Chicken, Fresh Tomato & Pesto Sauce. White Vegetarian Pizza with Broccoli, Onions, Mushrooms, Peppers, Black Olives and Fresh Tomatoes. Blanca Pizza topped with Fresh Tomato, Bacon, and Drizzled with Ranch Dressing. Blanca Pizza topped with Fresh Tomato, Chicken and Drizzled with Ranch Dressing. One of the most popular of all Italian desserts. Uncle Paulie uses only the highest premium brand of Ricotta Cheese. Sweetened just right then flavored with pure Vanilla. Chocolate Chips, Oreo Cookie, Pistachios, Walnut, Reese's Peanut Butter Cup, Mint Chocolate, Hazelnut. We have 2 Liters and 12 Ounce Cans of Coke Products. Hot Chocolate, Tea, Coffee and Iced Tea. Cooked to order. Consuming raw undercooked meats, poultry, seafood, shellfish or eggs may cause food borne illness especially if you have a medical condition. Limited delivery area...delivery (charge may apply).